We’d love your help. Let us know what’s wrong with this preview of Kate's Song by Jennifer Beckstrand. To ask other readers questions about Kate's Song, please sign up. OK, for the record I'm the author's husband, and my wife has turned me into a romantic over the years. Bias aside, I really enjoyed Kate's Song. What a great story! It flows from start to finish and the characters are outstanding. The Amish setting adds rich context to the story. I found myself very emotional as I read three particular parts of the book. (I won't ruin anything with more information.) I was inspired and uplifted. Way to go Jennifer! * Before diving into the book itself, I feel the need to warn you that as much as this book is a romance novel at heart, it is also a little different from what I typically choose to read. In many reviews, I have seen readers call it a “Christian Romance.” That threatened to turn me away from this book immediately. Although I am a Christian, I do not consider religion to play a strong role in my life, let alone find it to be a topic I enjoy exploring for relaxing enjoyment. Thanks to Amazon.com * Before diving into the book itself, I feel the need to warn you that as much as this book is a romance novel at heart, it is also a little different from what I typically choose to read. In many reviews, I have seen readers call it a “Christian Romance.” That threatened to turn me away from this book immediately. Although I am a Christian, I do not consider religion to play a strong role in my life, let alone find it to be a topic I enjoy exploring for relaxing enjoyment. Thanks to Amazon.com though and their daily deals of free Kindle book downloads, I had downloaded Kate’s Song before I was aware of it’s religious undertones. So I persevered and began reading – and not too far in I realized that I was thankful that I did. ‘Having your cake and eating it to’ is sometimes a tall order. For this novel’s central character, Kate Weaver, she would have to choose between the two. In Kate’s Song, by Jennifer Beckstrand, Kate is faced with choosing between 2 things she loves dearly and which ever she chooses will in-turn force her to abandon the alternative forever. Kate’s Song is about Kate’s choice between being baptized in the Amish community, as she was raised and as the love her life has chosen, or pursuing her remarkable talents as an opera singer which would likely lead her to a life of fame and fortune. If she chooses to sing, Kate will sacrifice her one true love and her family. And if she chooses to be baptized, she will never again be allowed to showcase her enchanted voice. Although the Amish are a very religious community and those teachings play a strong role in this story, for me, the book was ultimately about the value in the freedom to choose your destiny. How you choose (whether you follow God’s will, or it is your free will) is important to Kate but I found it to be of little importance to my enjoyment of this book. For me the love story, the battle of choosing and ultimately preparing for the loss of something she loves, was the heart and soul of Kate’s Song. Kate’s Song is an Amish romance. I confess, I’m not a romance reader, so I wasn’t aware this has become a popular subgenre. Well, I can see why. It’s clean, gentle, and heartwarming. Sort of like Amish people. I’ve always been fascinated by the Amish. I suppose I envy them–-their peaceful existence, their devotion. In the clamor of real life, it was nice to pick up this book and go somewhere quiet. That’s not to say the book has no tension or conflict. It’s there. But it’s more along the lines of Kate’s Song is an Amish romance. I confess, I’m not a romance reader, so I wasn’t aware this has become a popular subgenre. Well, I can see why. It’s clean, gentle, and heartwarming. Sort of like Amish people. That’s not to say the book has no tension or conflict. It’s there. But it’s more along the lines of “will they discover they both love each other despite the twists of fate” rather than bruised lips, heavy breathing and bodice ripping. Of course it’s not gritty reality. Some books serve a different purpose. Kate’s Song is well written and edited, published by Summerside Press. Two more Amish romances are on the way. Kate attending the academy, blessed with a beautiful voice. Eating an apple transport her to memories of the apple trees back home. A love that Nathaniel has for her awaiting her return. Her parents are worried she has so far choose.not to be baptized. The words flow, and the description feels real, to the choices that are heavy on her heart. Seeking God’s way, what will she choose. This was my first jennifer Breckstand book. This was also Breckstands first book in the Apple Lake series. I really enjoy Breckstand's writing style and found her characters to have depth and her story well developed. Kate Weaver is still on her rumpringa. She left home 2 years prior to attend a music academy and develop her beautiful voice that God blessed her with. This schooling and pursuit of her musical talent goes against the Ordung. After a traumatic event during her second year at school, This was my first jennifer Breckstand book. This was also Breckstands first book in the Apple Lake series. I really enjoy Breckstand's writing style and found her characters to have depth and her story well developed. Kate Weaver is still on her rumpringa. She left home 2 years prior to attend a music academy and develop her beautiful voice that God blessed her with. This schooling and pursuit of her musical talent goes against the Ordung. After a traumatic event during her second year at school, Kate returns home for safety and peace. She needs to seek the Lord's will for her life. Should she return to her promising opera career or settle down and be baptized and embrace her Plain heritage? Nathaniel King has been in love with Kate since they were 11 years old. He is thrilled to have her back in the community where he can court her. The problem is he does not know if Kate is home to stay or has feelings for him? Kate's return is surrounded from non acceptance from some family members and memories of the traumatic events involving some close friends from school. It seems to Kate the Lord has abandon her and is not hearing and answering her prayers for direction. The story of an Amish girl who longs to use the musical gift God has given her yet doesn't want to forsake her Amish upbringing and family is compelling, yet there were many aspects of this novel that were frustrating for me. For the most part, this book was a light, easy read with a storyline that made it difficult to put down in places, but I struggled to relate to the actions of some of the characters. I don't wan to spoil too much, but the main conflict revolves around a big misunderstanding The story of an Amish girl who longs to use the musical gift God has given her yet doesn't want to forsake her Amish upbringing and family is compelling, yet there were many aspects of this novel that were frustrating for me. For the most part, this book was a light, easy read with a storyline that made it difficult to put down in places, but I struggled to relate to the actions of some of the characters. I don't wan to spoil too much, but the main conflict revolves around a big misunderstanding stemming from a lack of communication between the hero and heroine. If you've read any of my reviews, you'll know that I really dislike this plot device simply because I'm not the kind of person who avoids talking to people when I'm upset, or sits brooding over a problem rather than dealing with it. I tend to be proactive about discussing things and addressing problems before they escalate, so I couldn't understand Nathaniel's actions. Rather than feeling sorry for him, I was just annoyed that he wouldn't go and talk to the woman he supposedly loved. The romance between Nathaniel and Kate is super sweet, maybe even too sweet in places, but I did really like Nathaniel's character at the start of their relationship. He didn't judge Kate based on her past behaviour and was always kind and caring towards her. But when the Big Mis. occurs, his view of Kate seems to switch instantly. I couldn't understand how he could change his opinion of the woman he loved so quickly, and based on hearsay. This bugged me. I almost didn't want Kate to get back together with him, given how drastically his behaviour changed. Maybe he was too perfect to begin with? My other issue is more of a personal pet peeve, and others might not pick up on this at all. I noticed some disturbing victim-blaming regarding the scene where Nathaniel uses violence to defend Kate from the men in the alley. As a pacifist, he feels uncomfortable with this, but he felt compelled to defend Kate, but he still feels sad for a while after the event, given how non-violence is central to his faith and he has failed in this respect. Lots of people in the community blame Kate for forcing Nathaniel to use violence. Forcing! In what way did she force him? By taking a wrong turn and ending up in alley with some men who could well have beaten or raped her? The comments made by people in the community--and Kate's own family--were worryingly similar to the whole rhetoric of "If she hadn't been wearing such a short skirt, he wouldn't have raped her." Kate in no way asked those men to attack her, forcing Nathaniel to jump to her defence. But a lot of the people in her community acted like it was her fault for being in the alley, or attracting the men's attention. There was also a comment about a woman "cheapening" herself by sleeping with someone before she was married, which made it sound like she was some sort of product or commodity for men to consume. Again, unless you read a lot of feminist literature, you might not pick up on this rhetoric at all, but it was difficult for me to overlook. Also, considering how important Aaron and his wife were to the story, I wished we'd had some insight into the motivations behind how judgemental they were. Ada sometimes seemed like she meant well, but just didn't think before she spoke, but Aaron sometimes came across like a Disney villain. Kate’s Song is such a heartwarming story because Kate struggles between her singing and her Amish faith. Her main interest is God’s will for her life, but just what is His will? Is it her singing career or at home in her Amish community? And the Ordnung will not allow her to have both. Kate’s journey is a difficult one as she struggles to make a decision. 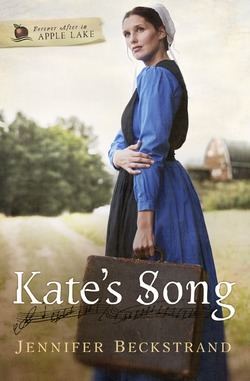 Jennifer Beckstrand is a new author for me, and I am very glad I had the opportunity to read and review Kate’s Song. I love how each author of Amish fiction has their own twist on their stories, and I love the writing style and the new twist on Amish fiction from Ms. Beckstrand! I really enjoyed getting to know the characters in this story, though some of them were frustrating at times! Kate was a sweetheart and of course I wanted the best for her, whatever it was! I love how the author weaves the story together with the Amish faith, worldly lifestyle with Kate’s music, the love of family, her struggles and difficulties, along with her faith in God, and the happiness she finds through following what God’s wants for her life. Kate’s Song is writing at it’s best, and I look forward to reading more books by author Jennifer Beckstrand! I received this book from the author, Jennifer Beckstrand to read and review. I was not required to write a positive review. The opinions I have expressed are my own. I am disclosing this in accordance with the Federal Trade Commission’s 16 CFR, Part 55. This was a sweet read that at times had a bit too much drama for me. I like the unique plot points - Kate has yet to be baptized and has to choose between her music career or her Amish life in Apple Lake. Some aspects of the plot were a bit predictable, and I didn't follow some of the characters actions and motivations. The big conflict came about from a "big misunderstanding." If the male lead, Nathaniel, would have simply asked Kate to explain her actions, there wouldn't have been a problem. I just found it hard to believe that since he was so in love with her that he wouldn't even give her one chance to explain what happened instead of hearsay or what he thought he saw. Despite the aspects that I didn't care for much, there was still a lot to enjoy in the story. My favorite characters were Kate's parents and her brother, Elmer. They were so loyal to Kate and very inspiring. I also appreciated that Kate came to her decision without basing it on Nathaniel, or anyone else, but based on her faith & what she felt was God's will. I had a like / dislike relationship with this book. I loved watching Katie grow in her relationship with God, seeing her get angry and question her relationship. Most readers can understand those feelings. There was one point I was so disappointed in where the book was going that I had to put the book down and walk away. As with most Amish books I read there was an accident that was a major turning point and also a misunderstanding. I don't understand after spending so much time together there wa I had a like / dislike relationship with this book. As with most Amish books I read there was an accident that was a major turning point and also a misunderstanding. I don't understand after spending so much time together there wasn't more trust in that relationship and then how quickly there was a new relationship and how serious it become so quickly. Knowing that this was Ms. Beckstrand's first Amish fiction novel, I wasn't sure what to expect. I wasn't disappointed. This was not written as your generic amish storyline. It had an added twist, a villain of sorts and the definite true romance. I loved the humor that the author has added into this story. Kate was given the gift of song with a beautiful voice. Because of this gift, she has a huge decision to make. A decision that is thwarted by her brother Aaron and her love for Nathaniel King. W Knowing that this was Ms. Beckstrand's first Amish fiction novel, I wasn't sure what to expect. I wasn't disappointed. This was not written as your generic amish storyline. It had an added twist, a villain of sorts and the definite true romance. I loved the humor that the author has added into this story. I'm a big fan of Jennifer Beckstrand's Huckleberry Hill series, but while there were chunks of this one that I really enjoyed, there was a lot of it that was just downright painful. I don't enjoy books where the conflict is driven solely by misunderstandings, especially when they are purposefully perpetrated by one or more of the characters. I did appreciate Kate's purity of heart in really seeking to follow God's will for her life despite what others had to say about it. Her tenacity in seeking I'm a big fan of Jennifer Beckstrand's Huckleberry Hill series, but while there were chunks of this one that I really enjoyed, there was a lot of it that was just downright painful. I don't enjoy books where the conflict is driven solely by misunderstandings, especially when they are purposefully perpetrated by one or more of the characters. One of my sons knows the woman who wrote this--she lives in Davis County. It is well written, but it had one too many misunderstandings for my taste as it drew to the inevitable conclusion. I can't stand villains that won't die, plot holes, overly emotional heroines and too many obstacles before the happy ending. An interesting story. I just get so frustrated when all the issues are caused because people don't tell each other what is going on. I wanted to give this book 4 stars but the male protagonist traded in his brain for a skull of rocks. It was irritating to read. This book could've been 100 pages shorter. So much emotion in this book. Yes I burned the midnight oil for this one too. Sooooooo good! What a great read! A lot of research for authenticity went into this book. The dialogue is charmingly Amish and the relationship between the characters amazing. I thoroughly enjoyed every word! I thought this book was a lot more nuanced than I expected at first glance. I appreciated Kate's struggle in finding her place in God's plan, and saw unexpected parallels to my own journey with finding 'my' song. I also appreciated how Elmer was willing to stick up for his sister. This was my first Jennif I thought this book was a lot more nuanced than I expected at first glance. I appreciated Kate's struggle in finding her place in God's plan, and saw unexpected parallels to my own journey with finding 'my' song. I also appreciated how Elmer was willing to stick up for his sister. This was my first Jennifer Beckstrand book, but it will not be my last. This is the first book i read, written by Jennifer Beckstrand. I enjoyed every bit of it. the story line was really good. Some of the dialogues spoken by the characters made me laugh out loud. Immediately made me want to get the other books in the series. Got them too. So much fun reading about other cultures. I loved Kate and Nathaniel but I'll admit, I had to skim over the chapters when she went back to Milwaukee, they seemed to drag on when I really wanted to know how everything worked out. Beautiful story of love, forgiveness and redemption. In our darkest hour is when we lean on God most. It was a hard lesson for Kate and Nathaniel to learn but when they trusted him, all things fell into place. According to His will not theirs. An exceptional story. It was not easy to read, not always comfortable, but well-worth the read! Jennifer has such a way with crafting a story and her characters feel like dear friends! I read this book because I had heard that Amish romance books were a thing. I liked this book, very pleasant. If you're looking for a very clean, very family friendly romance, check it out! Sweet story and definitely recommend. I got this book without even realizing it was going to be an Amish love story. I got attracted to this book by the title. I didn’t know what to expect from this one. I must confess I had no notion of the Amish religion. It is a fast paced Amish love story. I read it in 4 days. So if you’re in the mood for a quick read, this one is for you. I have to say that right from the start I found the story predictable. Kate has two options. She has to chose between following her dream or following her heart. I would’ve been highly surprised if in the end she chose the not predictable path, but like I said, right from the start you kinda know what way she’ll go. She had already made her choice. She just took a long while to realize and accept that fact. On the other hand, don’t let this predictability factor fool you. The story has interesting twists that make it entertaining. It surprised me to read certain attitudes I didn’t expect to find in the Amish culture. It was a little misleading to read that people who believe in finding good and God’s grace in everything, had no problem to rudely and harshly criticize, judge and condemn Kate for taking her time to make the decision she was expected to make. Kate had to deal with a lot of gossip, hate, bullying and betrayal. They all seemed to hate her because she was different. They didn’t have a problem alienating her without even letting her explain the situation. I couldn’t believe how naive and close minded these people were portrayed and how fast they can make bad radical judgments without even thinking of giving the benefit of the doubt. The love story per se is one for the hopeless romantics. Nathaniel, even though he’s a little too corny for my taste, said everything you want the man you love to say. He had his way with words, not only on the romantic side but also on the spiritual side. I ended up highlighting certain things he said, and found them spiritually uplifting. But even though he said the right things, his actions were contradictory. His reaction to the big conflict in the story made me want to punch him in the face. Thankfully the non-Amish brought him to his senses. The title ends up making sense until the end. Kate’s Song was a beautiful one and I liked how the song could also be considered as a character in the book. The end is a happily ever after one. Which could be enough, but not for me. I wish she would’ve found a way to have it all: her dream and love. It’s a fake story, so everything is possible in fake-land. Make me believe that you don’t have to give up anything to find happiness. That’s why this one didn’t get 5 stars. Another reason it didn’t get 5 stars is because I wanted to know more. I could read one more chapter on their happily ever after life. I mean, you can never have too many sprinkles or frosting on a cake, can you? It would have been nice to have an extra chapter in the end, where we could picture the first days post wedding. See how she adjusted back to her Amish life. Oh and definitely it would have been nice to read something about Kate rocking a baby on her perfect chair and singing a lullaby. A baby that got Kate’s gift . I would have given this book 3 stars, but the fact that it was on my mind for a few days after I finished it (3 days to be exact) made me give it 4 stars. I would read this author’s other books. Not that I’m eager to do it, but if I stumble upon her other books later in life, I would read them. I would love to just tell you every thing about this book and every thing in this book. But will not due to not wanting to spoil it for you. Let me say it this way. This book, Kate's Song Is A Must READ! You all know that Amish stories are some of my favorite books. Well this book has just been placed on top of all my books. Author Jennifer Beckstrand is an outstanding author. She captured my attention from the start and held it till the end. None of this book, or her writing style was in vain. I got the whole message of the book and story line was awesome. All of the characters in Kate's Song were great to connect to. Kate is one that of course you get to know due to her being the main character. But her whole story is one that you can relate to. It is written in a way that I was able to relate but then there were times I could relate to her mother. Being a mother of children around that same age, I could so see myself trying to allow Kate to decide her own future and supporting her, but then I also see the other side. The side where you want them to be safe and find the right partner. But I loved the fact that as far as Kate's ma and pa were supportive even though their beliefs were different. There were times when I wanted to scream at a few characters, who at this time will remain anonymous. Then I loved how author Jennifer Beckstrand's writing style brings in to story the "outside world". The story never lost any thing with in the different worlds. Which I so love. Some authors, just because there is some other kind of belief or world other than the main one, they loose the real part of the story. But not here at all. Kate's Song has love, faith, music, maternal love, which is different, and Kate in some ways proves this. It has family dynamics, mystery, how making the right choices in life and wrong choices can change you in so many different ways. This book as I said above is Diffidently A Must Read for young adult and I would even say some older teens may enjoy this book. Would recommend it to all my friends and book lovers alike. I enjoyed reading Kate's Song by Jennifer Beckstrand. I have not read many Amish fiction books so I feel that the plot, conflict and resolution were appropriate for an Amish community. Like many others have stated, I was frustrated with Nathaniel's stubborness and willingness to listen to Aaron and Ada rather than the object of his affection, Kate. I do think that there are probably a good many "Aaron's" in an Amish community, especially given that he is the oldest male child of a large family. He probably was expected to take on some of the "fathering" as the children got into things. He represented a strict adherence to the community rules. Unfortunately, he had a selfish angle to him and rather than being strict with Kate for her own good, it was more for protecting his own reputation so that he might one day take his father-in-laws coveted position. I loved Kate's innocent views on life. Her sense of what is right and wrong was well developed yet she had to decide weather to further her God given talents as a singer or become baptised and a permanant member of the church. I loved her loyalty to her friend and felt the conflict created was believable. I didn't buy Nathaniel's stubborness in not actually asking Kate about the situation and his unwillingness to listen to her when she tried to explain. I think if he was in love with her as much as he claimed to then he would have given her the benefit of the doubt and at least asked her who the child and man were instead of assuming the worst. Kate had never deceived him or anything so she didn't deserve his reaction in my opinion. I found the ending very satisfying and overall I loved the book. I look forward to reading Jennifer Beckstrand again. I gave the book 4 stars. My grandmother lives in a region where there are a lot of Amish and I've met several. I've always wondered about their lives and have always enjoyed reading books about them. I had this book on my kindle and started it last night, finished it tonight. Really enjoyed it, it is really well written and I learned some new phrases that the Amish use in this book. Some people explain the words and others just put the words in for what the call or describe something and assume you are smart enough to m My grandmother lives in a region where there are a lot of Amish and I've met several. I've always wondered about their lives and have always enjoyed reading books about them. I had this book on my kindle and started it last night, finished it tonight. Really enjoyed it, it is really well written and I learned some new phrases that the Amish use in this book. Some people explain the words and others just put the words in for what the call or describe something and assume you are smart enough to make the connection. That is what this author did. She has a series of books of the Amish and has Amish readers who check for authenticity. This was one I enjoyed more than some I like the way the author writes and couldn't put the book down.